If I were to put together an "ideal" outfit, meaning a look that epitomizes everything that I love about fashion, this look would be it. Fall slowly forces me to kick off my beach girl sandals and breezy tanks in favor of feminine pleats and sophisticated pumps. I carefully prop my bag onto my shoulder, and I am instantly transported to a different feeling, one in which I stand up taller and walk with more purpose. ﻿I feel like a new person in these pretty clothes. Isn't that what fashion should do? This is such a pretty outfit Noelle! Very feminine. You look fab! I love this outfit! 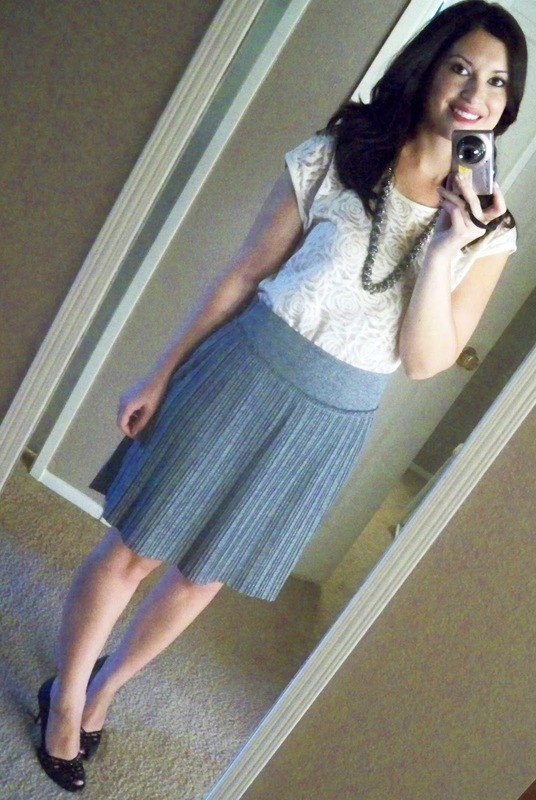 That lace top looks great with the pleated skirt. Gigi: Thank you, Forever 21 offers some beautiful surprises sometimes! I mainly shop there for accessories, but once in awhile I find some great clothing items too. Alison elle: Thank you. No one can tell it's actually a crop top when I tuck it into a skirt. I'm not a huge fan of crop tops, but tucking this pretty floral printed number is a perfect solution! Such a pretty, feminine outfit. 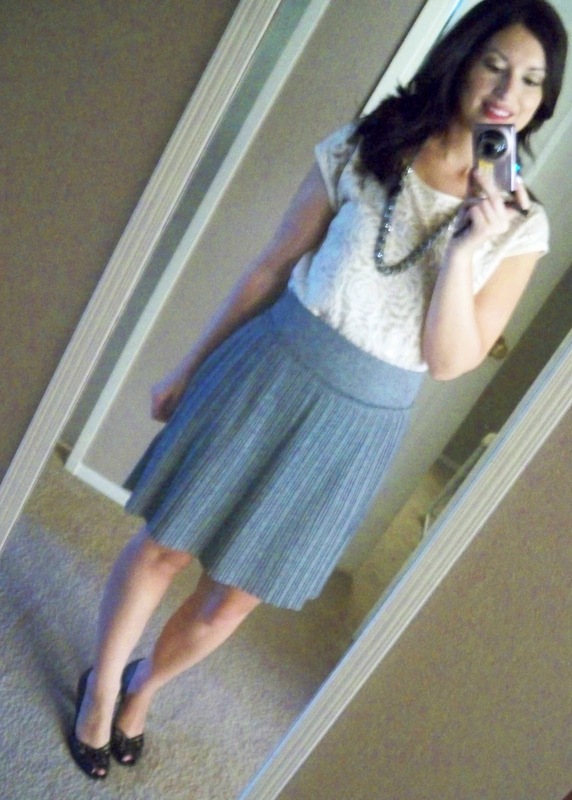 I love the gray skirt - the pleats are perfection! 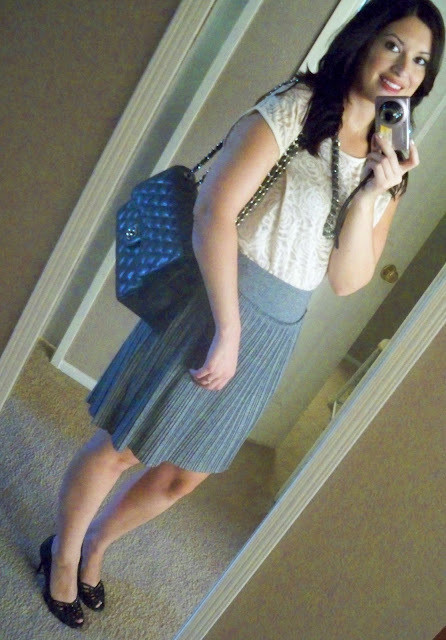 Such a lovely outfit and the bag is so fab! Cute outfit. I have been looking for a nice pleated skirt and have yet to find one. Love that you added the floral lace top to this. Such a great look. This outfit is very beautiful, and indeed very lady-like. 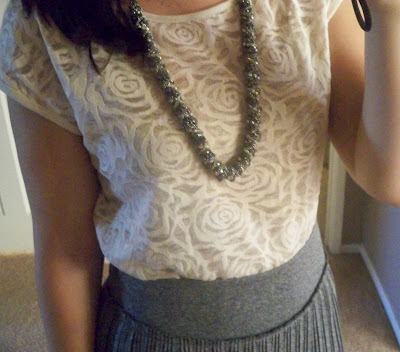 I especially like the rose blouse. Thank you girls! The pleated skirt was of course found in the petite section of Banana Republic, but it also comes in regular sizing too. I love it because it's such a soft fabric! I'll have to check the material, but it feels like nice cotton. In the past, I've had problems with pleated skirts being too flimsy. The top is great too. Forever 21 has some really beautiful cream and lace tops right now so go take a peek if you're interested! Lovely outfit...perfect for the fall! And of course the Chanel bag is the perfect accessory...naturally! You and I both have such a weakness for cream lace tops - you have SUCH a drool-worthy collection of them. Love your ladylike look! you look so pretty! I love this pretty, feminine outfit, it's right up my alley :) And of course adore your gorgeous Chanel bag! Tiffany and Alicia: You girls are very sweet, thank you! Awww...this outfit is really lovely! And the bag is a nice addition to the outfit.